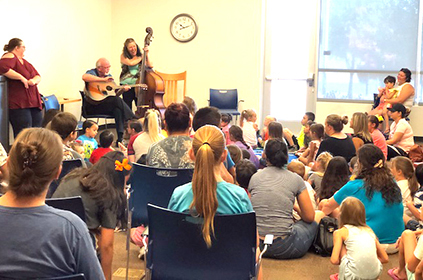 Artesia City Clerk Aubrey Hobson, on guitar, and his wife, Angie, on cello, perform such crowd-pleasers as “You Are My Sunshine” and “The Wheels on the Bus” last week to a standing-room-only crowd at the Artesia Public Library’s Musical StoryTime. The library hosts Children’s Musical StoryTime for ages 0-12 from 10-11 a.m. each Tuesday during the Summer Reading Program. A special guest from the community will share stories and books about musical instruments, with a different instrument featured each week.